Nearly a month after Texas State University students staged a campus protest and sit-in, police issued warrants for four students who allegedly tried to block police vehicles that were carrying student government senators who had skipped out on their official duties. According to the Austin American-Statesman, TSU’s Police Department issued warrants for 19-year-old Journey Alayna Carnahan; Nazarene Freeman, 18; Russell Lamon Boyd II, 21; and Madison Marie Houser, 21, for interfering with the public duties of a peace officer and obstructing a highway or other passageway, both of which are misdemeanors. The four undergraduates were part of an April 12 protest against a group of senators in the student government association who intentionally neglected their official duties in an effort to protect student body President Connor Glegg from being impeached. Clegg was under fire for a series of unapologetically white incidents after he publicly denounced a TSU student for reverse racism; threatened to fire members of the school newspaper for publishing anti-white propaganda; and posted a series of racist videos on Instagram. When it was time for the student senate to vote for Clegg’s impeachment, a cabal of his white allies decided to undermine the process by skipping out on the hearing, causing the vote to be dismissed for the lack of a quorum. Students held a sit-in in the student center to protest the fact that their elected officials chose to ignore their duties. According to students who spoke with The Root for our May 13 article, a group of student senators left the hearing before the vote. The protesters confronted two of the absent representatives in a campus garage as the missing school politicians tried to leave. When the senators tried to drive away, a police affidavit claims, a few of the students blocked the getaway car. 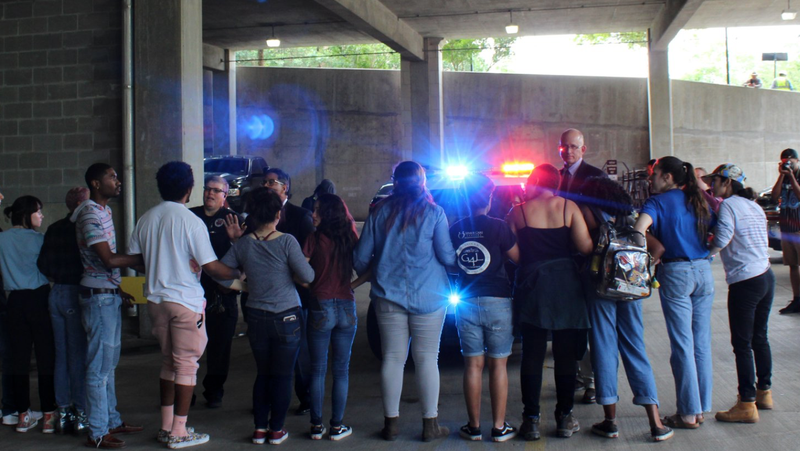 The elected officials responded by hopping into a nearby campus police car, and the students temporarily halted the police cruiser. Some students dispute the police account. Claudia Gasponi, one of the student senators and a senior at Texas State, said that the protesters were attempting to have a conversation with the student reps, but backed off when police intervened. “I think the university is not only overreaching but attempting to terrorize the student body,” Gasponi said. The student senate eventually met on April 18 and voted to impeach Clegg. His unrepentant caucasity attributes his ousting to the fact that he told student senators they should vote to impeach him for their own safety. Because, of course, those thug students who never laid a hand on anyone are dangerous. “Frankly, it’s an utter shame that the administration allowed this campus to be held hostage,” Clegg said, apparently unaware of how he held the students of Texas State hostage for his entire administration. All four students were arrested, booked into the county jail and released on bail, according to the University Star. Connor Glegg is still white.